San Francisco is well known for great places to dine. We can now add another restaurant to that category - the newly launched Jake's On Market is already one of our San Francisco favorites! Launched by owner' Tim Travelstead and Brad Becker and named for their son Jake, Jake's On Market offers "Contemporary American Food with an emphasis on California." They joke that the restaurant also gives Jake a good reason to have dinner with his parents! Jake's On Market is located in a historic building in San Francisco's popular Castro District. Its stylish decor was a choice made by Travelstead and Becker. "We have been open for 11 weeks. The decor was darker so we wanted to lighten it up, make it more comfortable, make it better for communication and give it more energy." The decor includes large historic photos provided by the San Francisco Historical Society - a perfect choice for an older building. The menu is based on the philosophy of Chef Erik Hopfinger - use the best ingredientsand serve everything fresh. The menu has proven to be a great choice. "We have been very fortunate. People keep coming back so that tells us that they like what we are doing. We have a broad menu for people of all tastes," said owner Tim Travelstead. Why open a restaurant in San Francisco? "I was a lawyer. I got tired of arguing with people and wanted to do something to make people happy. Jake's On Market lets me do that," Travelstead said. Not only do Travelstead and Becker make people happy with their food and beverages, they positively affect everyone around them with a business philosophy that is rarely seen. 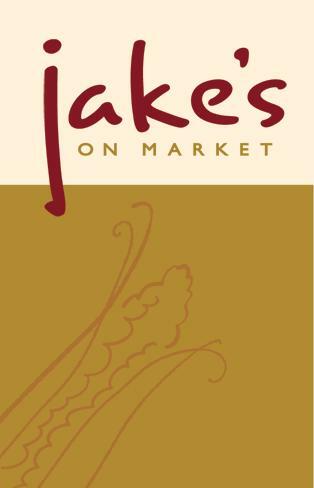 "Jake's believes in treating its customers, employees, community and local vendors with respect. All full-time employees receive health insurance fully paid for by Jake's. It's just the right way to do business. We're not just located in the Castro, we're a part of it. Our community room is available, free of charge, for non-profit organizations to hold small meetings." Impressive! Not only is their philosophy extraordinary, their food is as well. We enjoyed a Kiwi Cooler made with Kiwi and Cucumber (one of the best drinks we have ever had! ), a Strawberry Kiss (like a strawberry Mojito), Anchor Steam (a local San Francisco draft beer), Fried mozzarella, Maui O-rings onion rings, the Turkey Dinner and the Flat Iron Steak. The portions were generous, the service was excellent and the food was some of the best we enjoyed in San Francisco. House blend of fresh beef with lettuce, tomato, red onion, pickle and house-cut Kennebec french fries. Jake’s Risotto of the Day seasonal hand-selected vegetables, vegan or not? If you are visiting San Francisco, we highly recommend that you make a trip to the Castro District to enjoy Jake's On Market. You will be glad you did! For LGBT travelers, San Francisco offers a webpage dedicated to you! Visit http://www.sanfrancisco.travel/lgbt/ to see events, restaurants, clubs and even specially designed itineraries!